SGHS senior Curtis Haner delivers a pitch during a contest versus River Valley on May 4 in Bidwell, Ohio. SGHS senior Keirsten Howell awaits a pitch during a contest versus River Valley on May 4 in Bidwell, Ohio. Eastern captured a pair of outright league titles and also led the way in postseason honors with 16 selections to the 2018 All-Tri-Valley Conference Hocking Division baseball and softball teams, as voted on by the coaches within the league. Both the Eagles and Lady Eagles had eight selections apiece, which included a pair of coach of the year honorees in Brian Bowen (baseball) and Bryan Durst (softball). Bowen was also a co-coach of the year last spring. The Eagles had four other repeat selections from a year ago in seniors Austin Coleman, Ethen Richmond, Josh Brewer and Kaleb Hill, with Coleman being named the league’s offensive most valuable player after earning defensive MVP honors just a year ago. This spring’s defensive most valuable player award went to Richmond. 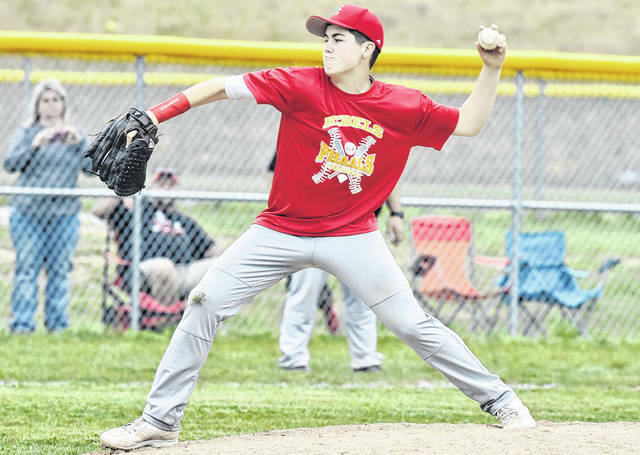 Senior Christian Mattox — a TVC Ohio honoree last spring — joined senior Owen Arix and junior Nate Durst as first-time selections to the Hocking baseball squad. The Lady Eagles had a single repeat selection in senior Sidney Cook, who was also named the offensive most valuable player for a second straight spring. Eastern also had first-time recipients in senior Courtney Fitzgerald, juniors Cera Grueser, Emmalea Durst and Kelsey Casto, as well as freshmen Tessa Rockhold and Kelsey Roberts. 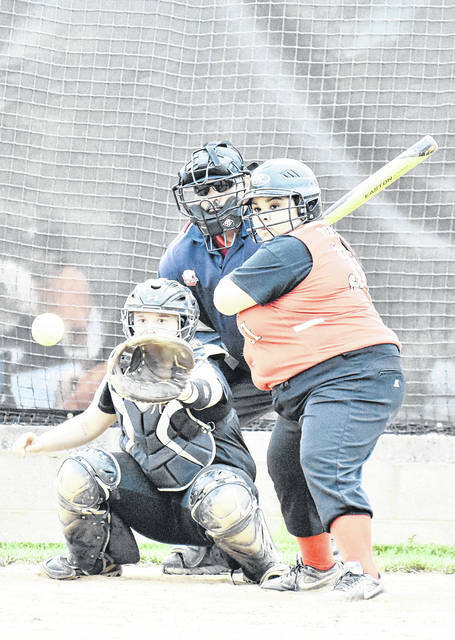 Both Wahama and Southern were next with nine total selections apiece, while South Gallia earned a total of five spots between the two squads. WHS had seven repeat honorees, SHS had six repeat selections and SGHS had one person return to the squad. The runner-up Lady Falcons had four players return to the all-league squad in juniors Maddy VanMatre, Hannah Billups and Emily VanMatre, as well as sophomore Hannah Rose. Rose also joined Katie Osburn of Belpre as co-defensive most valuable players in softball this spring. The White Falcons tied for fourth in baseball and had a trio of repeat selections in senior Dalton Kearns, as well as juniors David Hendrick and Tanner Smith. Junior Antonio Serevicz was also a first-time recipient of all-league honors in baseball. The runner-up Tornadoes had three repeat selections in senior Dylan Smith, as well as juniors Billy Harmon and Logan Drummer. Junior Jensen Anderson and sophomore Gage Shuler were first-time all-league award-winners in baseball. The Lady Tornadoes ended the year in a three-way tie for third and had three repeat selections in seniors Paige VanMeter, Jaiden Roberts and Sydney Cleland. Senior Lauren Lavender was a first-time all-league honoree in softball. The Lady Rebels placed seventh in softball and had three selections, including a repeat honor for senior Keirsten Howell. Senior Olivia Hornsby and freshman Makayla Waugh were also first-time all-league selections in softball. The Rebels were last in the baseball league standings, but did come away with a pair of first-time recipients in seniors Curtis Haner and Austin Stapleton. There were a total of 38 repeat selections to the All-TVC Hocking squads, which was split evenly at 19 apiece in both baseball and softball. EASTERN (14-2): Sidney Cook* (Sr) SS; Tessa Rockhold (Fr) P/1B; Kelsey Roberts (Fr) C; Courtney Fitzgerald (Sr) OF; Cera Grueser (Jr) 2B; Emmalea Durst (Jr) 3B; Kelsey Casto (Jr) 1B. WAHAMA (12-4): Hannah Rose* (So) SS/P; Emma Gibbs (Fr) 2B/C; Maddy VanMatre* (Jr) C/3B; Hannah Billups* (Jr) P/2B; Emily VanMatre* (Jr) CF. BELPRE (11-5): Katie Osburn* (Sr) P/SS; Madison Harman* (Sr) P/1B; Lauryn Simmons* (Sr) 3B; Hannah McDaniel (So) P/SS/1B. SOUTHERN (11-5): Paige VanMeter* (Sr) C; Lauren Lavender (Sr) CF; Jaiden Roberts* (Sr) 3B; Sydney Cleland* (Sr) P.
WATERFORD (11-5): Denise Young* (Jr) C; Emma Baldwin (Jr) P; Marissa Neader* (So) SS; Jordan Taylor (Sr) OF. TRIMBLE (6-10): Rhiannon Brown* (Sr) SS; Skylar Moore (Jr) 3B; Taya Lackey (Jr) C/CF. SOUTH GALLIA (4-12): Olivia Hornsby (Sr) SS; Keirsten Howell* (Sr) 3B; Makayla Waugh (Fr) P/1B. MILLER (3-13): Josie Perani* (Jr) C/P; Lacey Alexander* (Sr) SS; Chloe Rine* (Sr) CF. FEDERAL HOCKING (0-16): Tyra Mayle* (Sr) C/SS; Hannah Dunfee (Sr) 3B. Katie Osburn* (Belpre) and Hannah Rose (Wahama). EASTERN (15-1): Austin Coleman* (Sr) C/P; Ethen Richmond* (Sr) P/CF; Christian Mattox (Sr) SS/P; Josh Brewer* (Sr) LF; Owen Arix (Sr) RF; Kaleb Hill* (Sr) 1B; Nate Durst (Jr) 3B. SOUTHERN (13-3): Dylan Smith* (Sr) SS/2B/P; Billy Harmon* (Jr) C/P; Gage Shuler (So) SS/C/P; Jensen Anderson (Jr) 1B/P; Logan Drummer* (Jr) OF/P. WATERFORD (11-5): Noah Huffman* (Sr) P/INF; Braden Bellville* (Jr) P/3B; Bryce Hilverding* (Sr) INF; Austin Pyatt (Sr) C.
BELPRE (9-7): Logan Adams (So) SS; Nick Godfrey (So) P/1B; Bailey Sprague* (Sr) P; Jesse Collins (Jr) CF. TRIMBLE (9-7): Max Hooper* (Jr) SS/P; Noah Rossiter (Jr) CF/P; Cameron Kittle (So) SS/2B; Tyler Roback (Sr) OF. WAHAMA (9-7): Dalton Kearns* (Sr) P/C/INF; Tanner Smith* (Jr) P/C/INF; David Hendrick* (Jr) P/INF/OF; Antonio Serevicz (Jr) P/INF. FEDERAL HOCKING (4-12): Chase Reed* (Sr) SS; Nate Dearth (Sr) P/3B/RF; Justin Lopez (Sr) LF. MILLER (2-14): Trey Hettich* (So) P; Wyatt Vollmer (Jr) C; Lucas Dishon* (So) OF. SOUTH GALLIA (0-16): Curtis Haner (Sr) P/SS; Austin Stapleton (Sr) P/SS/2B.